There aren't many old Icelandic Horses in Iceland due to the abundance of horses and the need for horses to be productive, but here is a story about Tulle of Denmark. THE CROWN OF AGE FOR TULLE: 57 YEARS OLD. "Tulle and myself have been friends for 34 years, and now she celebrates her 55th birthday," a reporter was told in 1952 by eighty-one year old Andreas Larsen of Denmark. "She was 21 when I got her, and for another 28 years she pulled my little carriage with eggs from farm to farm. During the last war she even took the eggs to Copenhagen, a distance of 25 miles - at the age of 45 years! She knew all the highways and byways, and knew exactly how much time we might spend on each farm. If I stayed a bit longer with a farmer than was necessary for our work, she simply lay down in her harness and she broke more than one pole of the carriage. She educated me to be more punctual. After the war I told her that she would now live on my charity. She understood exactly, for last spring, when I wanted her to help me with the harrowing of the little potato field because my son had fallen ill, she refused and pretended not to understand me at all. I blamed her saying that it was unfair to leave an old man in the lurch, but she only turned her nose away obstinately. So I put myself to the harrow and began to pull. Scarcely had I taken the first step, when a big head was pushed under my arm: it was Tulle who felt sorry for her rudeness! She was quite aware of my being older and knew very well that this difference had to be taken into consideration. That is also why she never moved quicker than I did. She was always faithful, patient, and of the most gentle mind. The children of all the farms we visited on our circular tours, had all fallen in love with her. She never was ill during all her 55 years of life. How often I confided my troubles to her when we were together on the road and how often I spoke to her about affairs I should not have talked about with anybody else! And for many hours I would sit at her side in the stable or in the fragrant grass of her pasture. It was wonderful to be together with a horse for such a long time. Tulle bestowed upon me and my family nothing but bliss. She never deceived us." 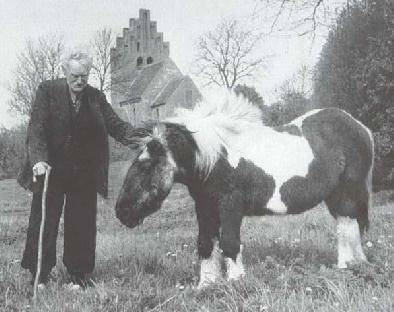 On the 28th of August 1954, the Berlingske Tidende published this news: "Tulle, the oldest horse in the world is dead. The grief about her master’s death broke her vital instinct. When one day Old Andreas Larsen did not come to her any more, she lay down, determined not to take food any more not to rise to her feet. There was not any symptom of an illness to be discovered: she simply faded away. Finally, the veterinary had to give her an injection for charity’s sake. There were several scientific institutes that quarreled about the acquisition of her skeleton. At last they agreed upon burying the oldest horse of its century honorably in the place where she had lived so long and had only given pleasure to people.